Through grants from the LeBaron Foundation, Compas has been carrying out a reforestation project that establishes shade grown coffee and cocoa trees using the miracle Moringa and Maya nut trees as shade. The goal is to create opportunities for farmers to earn income through the sale of coffee and cocoa beans, and at the same time, produce a nutritious source of food from the moringa and Maya nut trees. In January 2018, service trip groups from UVM and University of Wisconsin Oshkosh worked to create coffee tree nurseries in the backyards of host families in La Paz. The 2,000 coffee trees planted at each of the 9 host families will be given out to farmers when the rainy season begins in May. Through a grant from the LeBaron Foundation, Compas will be purchasing coffee trees as part of the reforestation project. Now, instead of purchasing the trees from a tree nursery, Compas will purchase the trees from the host families to provide them with extra income! 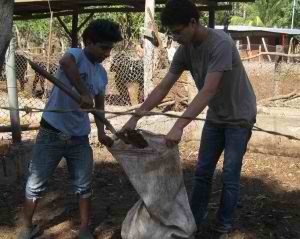 The service trip groups helped prepare compost, dig trenches, and fill and plants plastic bags with compost and coffee seeds. 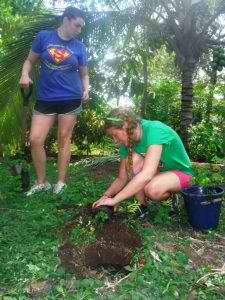 The families will water and care for the trees until they are ready to be distributed to farmers in May. We have been marketing the farmer’s Howling Monkey Coffee in the U.S. for several years now. We have also been working on marketing the cocoa beans and the cooking oil and leaf powder from the Moringa trees. We have been selling the cocoa beans in packages that include instructions on how to make your own chocolate. We have experimented with making chocolate with cocoa beans and have been able to produce a natural, organic chocolate with a rich flavor. We sell the cocoa beans to visiting service trip groups and also send them to the U.S. for sale to provide farmers with a profit. We have also finished the construction a solar dehydrator to dehydrate the moringa leaves in order to grind them into powder. Through a donation from the Starr King Unitarian Universalist Fellowship (Plymouth, NH) we how have a seed press in order to extract the oil from the moringa seeds. Both the leaf powder and the oil will be marketed and sold here in Nicaragua as well.